The Netflix adaptation of the long-running series of games and shows about a globe-hopping superthief places a value on understanding more than just history. 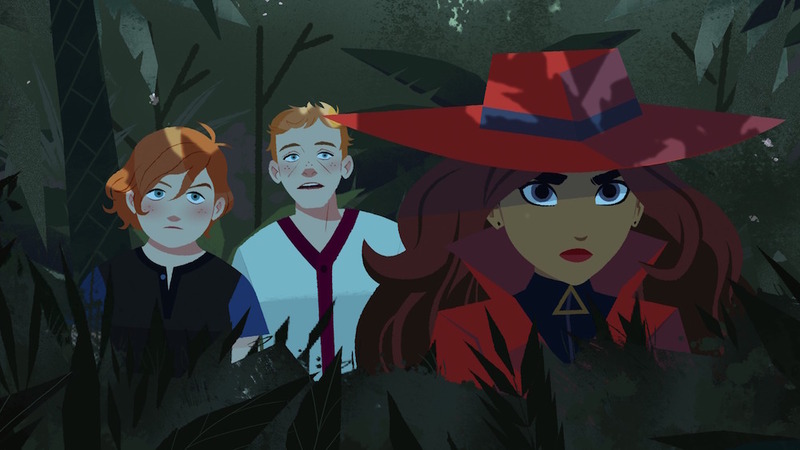 The first season of the new Netflix animated series opens up with a two-part story called “Becoming Carmen Sandiego,” which tracks Carmen’s (Gina Rodriguez) narrated journey from being the only infant on an island of elite trained international criminals to becoming the only one with the right tools to stay one step ahead of all of them. Though not told solely through her perspective, the show is still unmistakably hers even as she amasses more and more people trying to catch her. Once the series moves past that opening exposition, it settles into its episode-by-episode caper of the week format, which finds Carmen jetting (or souped-up speedboating) around the world to steal back priceless artifacts from the agents of VILE, the group of international thieves that she once longed to join. Through these adventures, the show still manages to steer into a few of the elements that hit home its educational DNA. A mini animated factsheet precedes a trip to each new country, giving an overview of local exports, notable customs, and relative population size in an informative, visually pleasing package. After beginning as somewhat benevolent trainers in the two-part opening, the various agents and central high council of VILE — shown scheming as their agents are dispatched to everywhere from Ecuador to the Netherlands — slide closer to cartoon villainy. But rather than a row of doughy mustache-twirlers, this new brand of baddies have a certain pizazz of their own. And their pursuits aren’t without real potential repercussions; Carmen’s first mission is to effectively save a major Indonesian food supply from an attempt at ecological sabotage. As dynamic as Carmen’s various enemies are, those within her camp take a little bit longer to find their respective grooves. As fun as the brother/sister team of Zack and Ivy (Michael Hawley and Abby Trott) are and as informative as the benevolent hacker counterpart Player (Finn Wolfhard) can be, they still serve similar roles as humanitarian henchmen. They’re the closest the show comes to making goofier concessions to a younger crowd, but as the series progresses and they become more than a series of quips, they’re an example of how a strong Carmen doesn’t have to come at the expense of the evolving depth of the supporting players, whether friend or foe. Rodriguez voices Carmen as someone who mostly lets her actions speak for her. This incarnation of the character isn’t solely built on personality and wardrobe. She’s just as compelling in the way she vanquishes her would-be enemies as she is in the pursuit of the still-unanswered questions about her real family. The goal of most episodes’ eventual hand-to-hand combat sequences between Carmen and her trackers is never for these agents to wantonly maim each other in pursuit of stolen paintings. But the show doesn’t sacrifice any stakes by steering its characters towards guns that dispense grappling hooks and GPS tracking devices instead of bullets. In fact, the show is richer for not setting up a simple showdown of brains versus brawn. These face-offs between the forces of VILE, Team Carmen, and other invested parties are compelling to watch because — like its central heroine — most people doing the fighting have plenty of both. Some of that layered ambition makes its way to the animation style as well. Not just confined to car chases and running against the backdrop of international city skylines, “Carmen Sandiego” follows an exciting inventive streak when it comes to VILE transportation and technological advancements. One of Carmen’s school nemeses has an energy blaster of sorts that stands out against the clean, precise angular lines of the 2D background. An early skydiving sequence swoops down from dizzying heights all the way to safe ground below. The venues change — there’s an underwater voyage, a journey through the desert, a slick maneuver in the halls of an art museum — but the range of character designs ensures that the humans battling over these treasures bring just as much vitality to what’s on display. 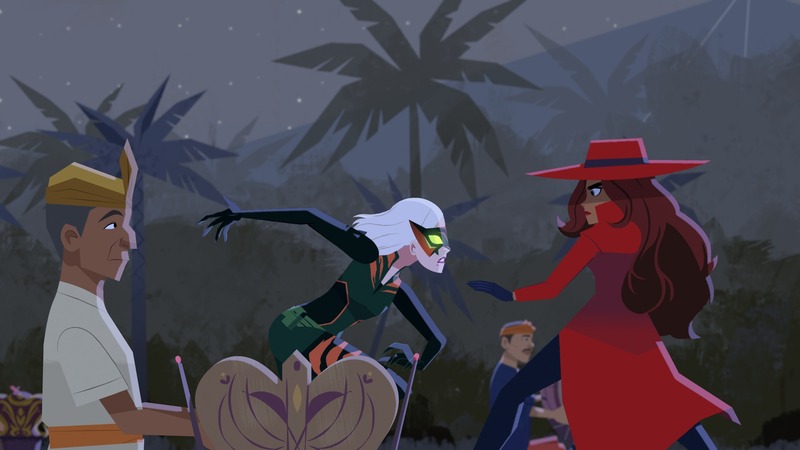 So “Carmen Sandiego” continues the tradition of educational entertainment, but the show has lessons beyond a textbook. It offers an implicit crash course in espionage thriller parlance and conventions, all while giving younger viewers an educational gateway to a bigger world. There’s a common refrain about the power of teamwork that’s more understood than underlined. And rather than attach a monetary or punitive value to these artifacts being swiped, the biggest lesson is how important and rewarding it can be to protect something worth saving. That’s always a helpful reminder. “Carmen Sandiego” is now available to stream on Netflix.